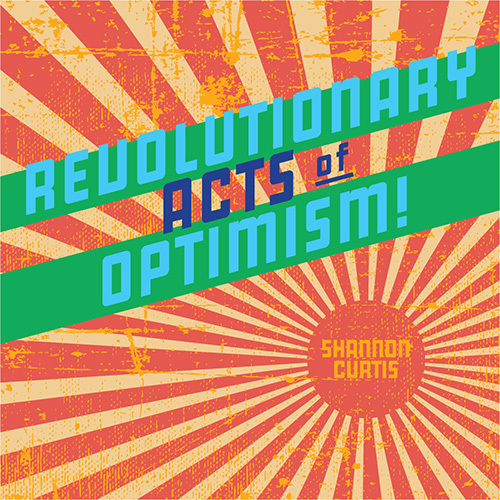 Help us bring “Revolutionary Acts of Optimism” to the world! What we’re doing here is community-supported art. — We’re creating music aimed at making an impact for good in people’s lives and in the world. — We’re inviting our community (that’s you!) to help us pay for the creation and distribution of that work. If what we’re doing matters to you, then we would grateful for your support. And, in fact, we can’t do it without you! to you into the world! Do it for the cool stuff you get in return! Help us kick off our fundraiser with a BANG! Some of my favorite t-shirts we’ve ever designed! Want your name in the album credits? We’ll do that. How about I write a Personal Song for you? Yep. Want to give the gift of a concert to a group who wouldn’t otherwise be able to experience one of our house concerts? We’d love to do that in your honor. And lots more to choose from! Visit shannoncurtis.net to pick out your Thank-You Package today. So, Shannon … optimism, huh? Isn’t that a little trite? And … what’s this about it being revolutionary? First of all. I’m tired. How about you? — Because everyday life can be exhausting. — Because the news often seems to be a firehose of trouble. — Because there are days that with every bit of progress I make, the more I feel like I’m falling behind. And my heart is broken. How about yours? — Because there are unhealed relationships in my life, and people I care about are hurting. — Because sometimes, things I’ve given my heart to don’t bring the love back to me that I’d hoped they would. — Because the suffering in the world seems so much bigger than me; the problems, too complicated ever to be solved. Discouragement, hopelessness, and cynicism are easy to come by. And if that were the end of the story … well … then … perhaps it would be time to close up shop. Give in to the powers that be. Let the status quo win. … there were another way? What if there is more available to us than we’ve seen? What if we are more powerful than we know? What if there is enough of what we need for all of us? What if there is a whole other frame through which we can take in the view? Our optimism is an act of revolution. … followed by a choice to focus our eyes on what’s possible. Goal #1: Making the album & printing CDs. Goal #2: Publishing a Revolutionary Acts of Optimism Book of Lyrics & Essays, AND hiring a talented young student filmmaker to create a short film for one of the songs on the record. Goal #3: Pressing vinyl records. Heck yeah. Thank you so much for lifting us up! Let’s do this.